RUSH: Well, it looks like President Trump has been proven right again. You know, the past couple of days I have been looking at all of these reports on how the Mexican government has been organizing the buses for this caravan of people. By the way, this caravan of people is another organized protest, another organized rally, and the people in the march, the people in the caravan have nothing to do with it, other than to keep walking. But they have nothing to do with organizing it. I will demonstrate this in mere moments. But before I get to that, yesterday and today all of these reports on how the Mexican government has been organizing the buses for the caravan of people coming in, primarily from Hondurans, and they would get so far into Mexico and the Mexican government would organize buses and send them along to the next checkpoint, helping them with their transit visas. And it reminded me, for some strange reason, it reminded me of the hissy fit that the Drive-By Media had the day that Trump descended the escalator to announce his run for the presidency. Do you remember the horrible thing Trump said that day? Well, here’s the quote. Let me remind you. (imitating Trump) “When Mexico sends its people, they’re not sending their best. They’re sending people that have lots of problems, and they’re bringing those problems to us. They’re bringing drugs. They’re bringing crime. They’re rapists, and some I assume are good people.” And there was an explosion in the Drive-By Media. It blew up. I remember sitting here and watching this. I reacted with laughter. I said, “There is no way — (laughing) what did we just hear? This is an announcement of the candidacy for the presidency of the United States, and this is the first thing the president said?” I started laughing, and I said, “There’s gotta be something else going on here. This can’t actually be a run for the presidency.” And of course it turned out to be exactly that. Why did the media blast Trump? You might think it’s a rhetorical question. They could not deny that illegal aliens from Mexico bring problems. I mean, it’s undeniable that illegal immigrants bring drugs and bring crime. And so they blasted Trump for blaming the Mexican government for sending these people because Trump also made a point of saying, “The Mexicans don’t send us their best. The Mexicans send us the people they don’t want,” is what Trump said. The media told us this was preposterous. The Mexican government doesn’t send anybody to the United States. That was a big point the media made. They don’t send anybody. Mexico’s got nothing to do with this. Well, the caravan, among other things, shows that the Mexican government sure as heck does send us people they don’t want in their country, in this case they’re people from Honduras. And so once again something that Trump was mocked and ridiculed for saying has proven to be true. And I remember that day like it was yesterday. I remember the Drive-By Media reaction to it. I remember my own reaction, which was uncontrollable mirth and laughter, not at the unfortunate circumstance of criminals and rapists coming to the United States. Just that anybody would say it in the context of seeking the presidency. And I thought, like everybody, that the first polling data that showed up after this, that Trump would be in minus approval territory. And do you remember the first polls that came out? It was less than a week after Trump announced, and they were through the roof. And when I saw those polls was the first time that I actually considered the possibility the guy could win. Then the rallies began and of course the rest is history. And I was one of the first in major American or worldwide media to posit that the guy could go all the way, when nobody, even up to election night, very few people even up to election night thought that Trump had the slightest chance to win. But that’s just to set the table and to remind everybody what Trump said in his candidacy announcement. Now, the latest news on this, we have a story here, this is from the Washington Post. “That Caravan Of Migrants Trump Was Tweeting About? Mexico Stopped It.” Now, wait a minute. If Mexico wasn’t involved in the first place, how could they stop it? “The Mexican government on Monday evening moved to break up the caravan of migrants traveling through southern Mexico, with immigration officials registering the travelers and suggesting some could receive humanitarian visas while others would have to leave Mexico. “The caravan, estimated at more than 1,000 migrants, many from Central America, has gained increasing visibility because of tweets by President Trump that have criticized Mexico for not doing more to stop the flow of migrants to the southern border of the United States. 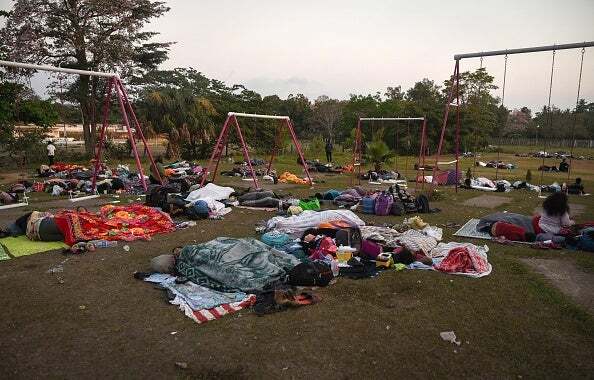 “The bulk of the migrant group — part of an annual caravan intended to raise awareness about the plight of people making the dangerous trek across Mexico toward the United States — is currently in the town of Matias Romero Avendano in the southern state of Oaxaca. 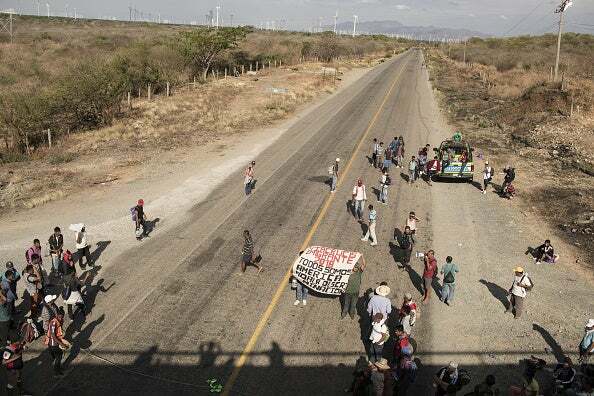 A portion of the group rode by train to the neighboring state of Veracruz, according to caravan organizers, local officials –” A lot of organizers here for something that’s supposed to be an organic trek. “It is unclear if that group has so far dispersed. The larger group, in Oaxaca, was being registered by immigration officials on Monday, according to people traveling with the group. An official from Mexico’s National Institute of Migration told BuzzFeed News that Mexico plans to disband the caravan by Wednesday and that some vulnerable people, such as pregnant women or those with disabilities, would receive humanitarian visas, while the rest will be expected to leave Mexico within 10 days or apply for permission to remain in Mexico for a month. And of course Trump tweets about it and Mexico stops it. Even here according to the Washington Post, “Trump’s tweets have focused on the caravan story, one that was pounced upon by conservative media.” What do you mean, conservative media? Everybody’s been pouncing on this, because this caravan, it is an annual trek. This caravan is like any other incident used by the left to portray the United States as insensitive to the suffering of the people of the world and unmoved by their poverty, and that we are mean-spirited and racist and bigoted and exclusionary because we don’t want these people here. Now, I talked about this being another organized protester movement. I’m holding here in my formerly nicotine-stained fingers a statement: “Migrant Caravan, Raising Concerns in U.S., Takes Break in Mexico.” And then there’s this. “Refugee Caravan 2018. The Struggle: Migrants in the Fight.” And it’s a memo supposedly from the migrants, from the people on the caravan to the governments of Central America, Mexico, and the United States, to the media, to human rights organizations, to civil society. So we are supposed to believe that these caravan marchers are the equivalent of the students at the Parkland, Florida, high school who are experts in what they’re doing and have marshaled their forces. They have organized to protest against discrimination in the United States on the basis of religions, genders, gender expressions, and sexual orientations. And this is why they’re marching. This is why they’re in the caravan. Now, you’ve seen photos of these refugees in this caravan and elsewhere. Do you see a lot of different gender expressions or sexual orientation? Does anybody see any of that when you look at pictures of this caravan? No. I’ll just tell you, no. Instead, it’s clear that this press release was written by the usual radical leftists who are seeing a movement here and co-opting it and taking it over. And it is calculated to exploit a change in our amnesty laws made by Obama in 2011. For example, here are the demands in this press release from the marchers in the caravan. “We demand of our Central American countries an end to political corruption, an end to violence against women and the LGBTQIA community.” So we are to believe that these people walking in the caravan are aggrieved, discriminated-against gays and transgenders, and they’ve had it. They’ve had it with the corrupt governments of Honduras, El Salvador, Nicaragua, Mexico, and they are coming to the United States, which they’re also fed up with, to make it all right. Now, this is related to December 6, 2011, a press release from the White House in which Obama announces executive orders that he’s placing in the Federal Register, presidential memorandum: “International initiatives to advance the human rights of lesbian, gay, bisexual, transgender persons.” This is why they’re doing this, because Obama paved the road for it all the way back in 2011. So, once again we are seeing what is to appear to us as a spontaneous, natural, and organic caravan, a movement of people from war-torn, poverty stricken areas seeking solace, seeking freedom, seeking shelter, seeking benefits, seeking a dignified life in the United States. And of course it’s nothing of the sort. It is a preplanned event that happens every year. What’s new about it this year is that the left has made an attempt here to totally commandeer this thing and to convert it into one of its own causes, or a series of their own causes, like they did the aftermath of the shooting at the Parkland, Florida, high school or anything else. And I don’t know, folks. These things just continue to happen, and there is not a single incident, it seems, anywhere that isn’t instantly politicized by the Democrats and by the American left. And I just wonder if people are beginning to get fed up with this. I know it’s a hope. I certainly hope people are getting fed up with it. Because it’s just a page in the playbook that’s being recycled and replayed over and over again. And the foundation of all of this is that America is unjust, America is unfair, America’s immoral and indecent, and America owes the poor people of the world, America owes the people in Central America, America owes this, owes that, because we are ultimately responsible for the plight these people are in. That’s the overriding theme behind all of this. And I ask myself, how long are people gonna sit there and passively put up with hearing how rotten their own country is? Every time there’s some such event like this that can be turned into a protest against America, it happens. It is aided and abetted by the media and the Democrat Party. And I just wonder how long people are gonna put up with all of this, and simply after a time, refuse to play ball or react as they are supposed to react. We got people fleeing Honduras because they think their election was rigged. We have people fleeing Honduras because of corruption. Why can’t that happen here? Why don’t the left flee America instead of protesting everything? I kind of like this, Hondurans leaving their own country in protest. But how silly and stupid do they think we are? Every election now the left loses is corrupt and somehow illegitimate and all forms of protest that follow are the essence of legitimacy. “Gina Garibo, one of the organizers for Pueblos Sin Fronteras … denied the caravan was over. ‘We have to follow through with our promise’ to help people gain asylum in the United States or Mexico, she said. Migrants would continue moving but in smaller groups than the caravan.” And BuzzFeed quotes another organizer, Alex Mensing (that’s a great Hispanic name: Alex Mensing) who said, “Don’t be fooled. The government isn’t ‘disbanding’ it. “It’s conceding its participants’ right to apply for asylum without traveling in the shadows.” So BuzzFeed that says Mexico’s lying. They’re not stopping anything. They’re letting the migrants continue. If this gets close to the border, and if these migrants do what the left wants them to do — if they start rioting and causing all kinds of problems at the border — does that not offer Trump the opportunity to then move assets to the border to shut it down? I’m just asking. RUSH: My friends, this caravan business, look, it’s getting intricate out there, and there’s a lot of, well, deceit that’s being used. The Drive-By Media is doing everything it can to change the identity of this caravan. They’re doing everything they can to make it look like it’s disbanding, to make it look like it’s breaking off into smaller groups that are not organized and therefore don’t present any kind of a problem. So the Drive-By Media theme here is that Mexico has basically moved in to stop this, which they haven’t, that the caravan is continuing. The objective is to get these people here, and that hasn’t changed. I think it would help everybody to know what it is — and you actually know, I just want to remind you — what it is that makes this possible. Do you remember the loophole that was discovered by the Obama administration? ‘Cause it’s the key to this, it’s the reason these caravans happen annually. It is the reason why people in the caravan think they have a legitimate shot of being allowed to cross the border. And it’s the real root cause of this. And the Drive-Bys are totally ignoring this. There is a loophole in our immigration law that prevents any person from a country not contingent to the U.S., meaning other than Mexico or Canada, from being immediately deported. So if you come from El Salvador, if you come from Honduras or Nicaragua, you cannot be automatically deported because your country is not contingent [sic] with us. Mexico is. We have a border with Mexico. We have a border with Canada. We don’t have a border with Honduras. And so the loophole in the immigration law, it’s actually there. Obama discovered it and used it for this express purpose. Remember all of the busloads of children that were just pouring across the border two and three years ago, three and four years ago now, do you remember? We were told it was children from El Salvador and Honduras. And we were told that these children, they were arriving on trains. Their parents, we were told, were putting them on trains. Their parents wanted a better life. Honduras, Nicaragua, El Salvador, war-torn areas, poverty, suffering all over the place. So these parents, wanting the best for their kids, put ’em on trains alone. And the trains made the trek up through Central America through Mexico. Once they got here, we had to let ’em in because of the loophole in the law. If they come from Mexico, we can refuse them entry at our whim. This is immigration law. If they come from a country not contingent [sic] to the U.S., they cannot be immediately deported. Instead, if they ask for asylum, they are allowed to stay in the U.S. while they wait for their asylum application to be processed. What the Obama administration was doing was finding leftist families to take these immigrant kids. And, of course, the reason was because once those kids got here, then how do we keep their parents out? And that was the objective of the parents. The parents wanted to come here. The best bet was to send their kids alone on trains because we would not reject them since they don’t come from Mexico. And this is at the root of this caravan stuff. That’s why it’s happening. And that’s why everything you hear about this tells you that the members of the caravan are from Honduras, that they’re not from Mexico. Now we’re going through this so-called drill that the Mexican government is stopping them, the Mexican government is stopping the caravan. But the BuzzFeed reporter imbedded in the caravan said it’s not happening, that the leaders say they’re gonna continue their trek. Let’s go to the audio sound bites. GUTIERREZ: We certainly understand the concern not only that President Trump has, but people in the United States here have about immigration. And I have to say that Mexico is now largely a country that receives immigrants. It’s a source and a destiny for immigration. So we understand this very clearly. And what we’re trying to do precisely is to work with the United States and Central Americans first, again, to address the cause of immigration. Because if we don’t do that, it’s very difficult. And, second, to achieve migration policies that allow us to better manage the phenomenon. RUSH: Okay. This guy’s right about one thing, and that is “what we’re trying to do precisely is to work with the U.S. and Central America first to address the cause of this.” Why do people want to leave their homes? It’s not hard to answer the question. But dealing with that is yet another thing. Also, this guy makes it sound like Mexico welcomes people in. Oh, yeah, Mexico is an immigrant destination. Try it. Try to emigrate to Mexico. Try to become a citizen and see what you have to go through. Well, you can’t, essentially. Try it. I mean, a lot of people live in Puerto Vallarta. A lot of people live in Mexico because the real estate’s cheap, retired people move down there, but as far as citizenship is concerned, no way, Jose. It is difficult as hell. And it’s hard for me to believe that Mexico has become an immigrant destination because these people in the caravan are not stopping there, they’re not stopping ’til they get here because the long-term objective is for all these kids in this caravan to get their parents here. And Trump’s been hearing about this. Some of Trump’s most ardent supporters think that he’s kind of, not gone wobbly on it, but he just lost some of his enthusiasm that he’s had for this, as other issues have taken precedence, and they’ve let him know. So he’s trying to make it clear that he’s every bit as focused on this as he always has been, and he’d better be, because this is it. This is the issue that could do the greatest damage to destroying, have the greatest impact on destroying the American culture. RUSH: President Trump says he’ll send the military to the border to deal with the caravan if he has to. It’s in The Daily Caller. Okay, hang on, folks. I didn’t get to the phones in this hour. I wanted to, but it just didn’t happen.